Choosing batteries is a big deal regardless of whether you are powering your boat or RV. Many people wonder what the difference is, if there even is one? 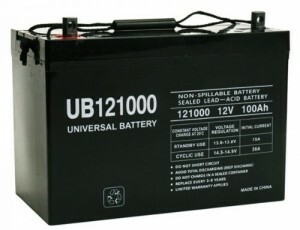 Others wonder if they can use one battery for another application, such as a boat battery in their RV. You no longer need to wonder. Here is the truth about batteries and what they may be used for. Is There A Difference Between The Best RV Battery & Marine Battery? 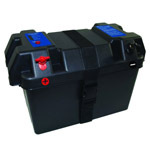 RV batteries are typically lead acid batteries. This means they have several cells that are connected in a series so that each one will produce about 2.1 volts. It is made of plates that are submersed in 36% sulfuric acid and 64% water. These batteries do not make electricity, instead they simply store it. They have cold cranking amps (CCA) which may deliver a burst of power quickly and then they have amp hour ratings that allow them to slowly discharge amps over a longer period of time. This is very important when you are using an RV without recharging the battery because it ensures that your lights and television, air conditioner, or other appliances keep working for a longer period of time between charges. When it comes to marine batteries, there are three different types of battery available. There are flooded batteries, which use sulfuric acid and lead plates. 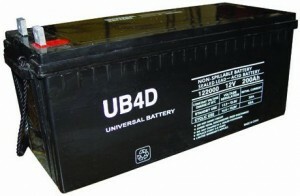 The Gel battery which is very sensitive to overcharging and therefore not preferred by many boaters. AGM batteries use glass mat separators. They are maintenance free and shock or vibrations do not have as much impact on them as other types of marine batteries. 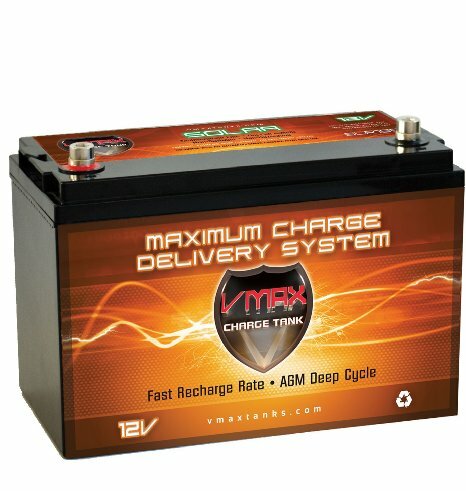 Once you have decided the type you want, you will then need to decide whether you need a cranking battery that has a high level of CCA or a deep cycle battery that allows you to have a slow discharge within the reserve capacity. Is It Safe to Interchange RV & Marine Batteries? If you have an RV battery that has enough CCA to fire up your boat or you have a marine battery that has a larger reserve capacity and a slow discharge, you should be able to use them interchangeably as long as they are 12V batteries. However, some people prefer the AGMs in their marine batteries, because there is less chance of acid spilling inside of their boat when they hit waves or have a lot of vibrations within the boat. 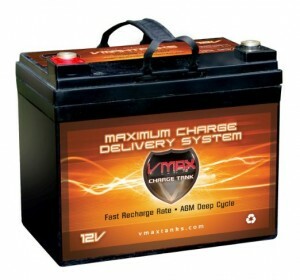 For this, one of the main things you need to consider is whether your marine battery has enough reserve to power your RV and all that you may want to use inside of your RV between charges. For instance, when it comes to your RV, the best RV battery may not be the Optima Batteries 8016-103. Even though it is one of the most popular marine style batteries, because of its CCAs and the fact that it slowly discharges, it only has 120 minutes of reserve power. For most RVs 120 minutes will not enable you to sleep comfortably with the accessories on throughout the night. Another type of lithium RV battery may be great for running a few lights or a radio on your boat for the night. For a full review of the Optima Batteries battery, you can look in our Optima Battery Review Here. A solar battery, is most often 6 volts and you would have a few of them powering one item if you were going to use them in your RV or on your boat. They are typically golf cart batteries. This means if you do not mind having a few batteries on board or in your RV, you should be able to use them for power. If you are trying to use a marine or RV battery for your solar set up, you may not get the life expectancy you are looking for from your solar set up. You do have to be careful and make sure you take care of your battery because there have been some cases where these batteries explode due to overcharging on sunnier days. Therefore, you may want to consider other options when you are looking for a battery for camping unless you have an RV battery monitor. To give you a better idea of the types of battery available and help you decide which one is best for you, you can view the batteries listed below. Perhaps one of these will be closer to what you have been looking for. This is perhaps the best battery for solar storage available. It has double the amount of volts that typical solar batteries have and a very large amount of amp hours. It is in a sealed box so that you do not have to worry about acid spilling out. As a solar battery, it is designed to last when used for solar applications, specifically RVs. This battery is acceptable to use with solar power and marine battery uses. It has the standard CCAs for RVs and marine uses. 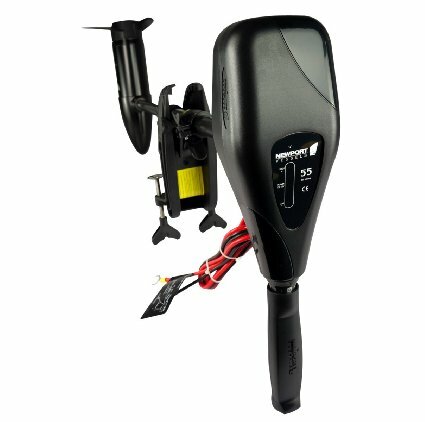 The downside is that you only have 100 amp hours of reserve, therefore many people opt to use it mostly in their boat. This deep cycle marine battery can slowly discharge over an average of 4-9 hours running time with only a 50-60% discharge. This means if you are looking for a travel trailer battery you may need a larger battery, but when using trolling motors and other devices on your boat, you should have more than enough power. Many people feel that it is one of the best batteries available because it uses tin-lead alloy in the inner plates rather than calcium-lead alloy. 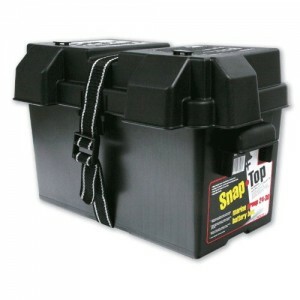 This battery box is considered the best RV battery box available. It can be used for automotive and marine batteries, as well as RVs. It is impact resistant to -20 degrees, will not be damaged by acid, gas, or other contaminates, and works hard to keep your battery protected from water. It also allows for ventilation so that you do not have to worry about your battery being enclosed. It meets all coast guard codes and regulations as well as the American Boat and Yacht Council’s specifications.